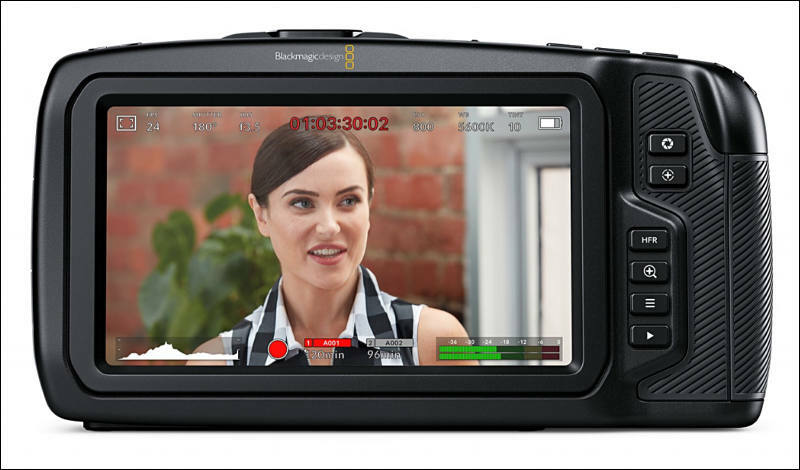 Built-in 5" LCD touchscreen allows accurate focus when shooting 4K. LCD supports on-screen overlays including status, histogram, focus peaking, and transport controls. Multi-function grip for quick access to recording start/stop, still photos, ISO, shutter, aperture, white balance, power and more. The shape is weird. Obviously, it shows the top of the camera. On the left, the standard playback controls (similar to the old Pocket), on the right maybe off/on switch and record button, in the middle a 3/8" screw mount (just like the old Pocket with its top screw mount). But what is the strange bulge in the middle? The lens mount, it seems, or an EVF? May be it is part of front modular part that contains sensor and mount? Interesting theory. So maybe the camera comes with swappable sensors/mounts like the Ricoh GXR. If that is the case, I strongly suspect the 4K module to consist of the same sensor as the Micro Studio Camera 4K camera - with 4K, but two stops less dynamic range, a base ISO of 400 instead of 800. They could offer the 1080p sensor from the old Pocket and the Micro Cinema Camera as an alternative module for people who favor low light and dynamic range over resolution. I think the sensor/mount part could be a detachable micro that's attached to a pocket wireless controller/monitor. Astonishingly the original BMPCC is still selling secondhand for more than its old sale price! Such is the strong popularity it has maintained. This is quite interesting, after years of hope, speculation, scrutiny, it finally comes to pass. Can't wait to see and hear by Monday. @eatstoomuchjam I already own one, and love It! My best purchase ever? I got it during the same ages ago. Very nice! Exciting!!! But... it better have some over-cranking ability at 4k... or it'll be almost useless like so many others. Correction: "useless (to me), but still generally useful to thousands or millions of others"
Everyone I work with on a professional basis... in films, advertising, music videos, ect ... would love like a compact camera like this but wouldn't be able to even make a small investment if it doesn't 60fps (at least in over-cranking output). I know like 4-5 people personally that would have bought something like an AS7II in a second if it offered higher frame rates at 4k. It blows me away that there are actually people that DON'T need over-cranked footage these days. I don't think I've done ONE project in the last two years that art-directors or clients didn't want slow-motion on. It border-line a MUST... unless you're working on personal-narrative films. Sure. Almost nobody that I know says that 4k at 60 fps is absolutely necessary to what they are doing. So to say that the camera is "useless" because it doesn't have that is just plain incorrect. It is useful to a large number of people, just as many other cameras are. Anyway, it is very unlikely that the pocket camera will support that - that would bring its specs way too close to the Ursa Mini and I can't imagine that BM are all that excited to cannibalize sales of their bigger camera. @bwhitz obviously there is a (technical) reason that HFR 4K doesn't exist in masses. Even C300 II is limited to 4K30p, EVA-1 internal 4K/60p only with 150mbs, C200 only in RAW etc etc..
More than 4k/30p will melt the little Pocket, but 2k/120p would be nice. Whoever is going to the black magic party tonight find out the scoop , I can not attend. lol, I dont want to repeat the other thread... but I can't. Even though I really wanted the GH5 or GH5s. The in camera sharpening and NR cant be turned down far enough. The image looks like blown-up 2k. Gross plasticky crunch on the fine details. 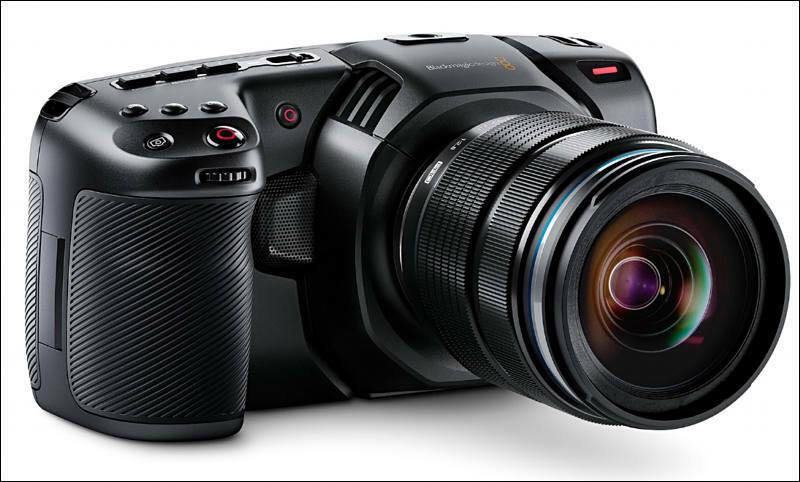 In what is seemingly a great irony, I can't find anywhere that will have a live stream of the Blackmagic event tomorrow morning at 9AM. You'd think someone would be broadcasting from the National Association of Broadcasters convention, no? If anyone finds a link or at least someone who says they'll be live during the event could you share it? Light sleeper here, but thought I share this. Does not look flippable to me. But mount is m43.